Bring the restaurant taste home with the National Presto Dual Basket ProFry Plus Stainless Steel Deep Fryer If you've ever wondered how you could get crispy French fries or perfectly fried chicken at home, then the National Presto Dual Basket ProFry Plus Deep Fryer is the answer you've been looking for. With two extra-large capacity baskets, you'll be able to fry multiple meals at once. 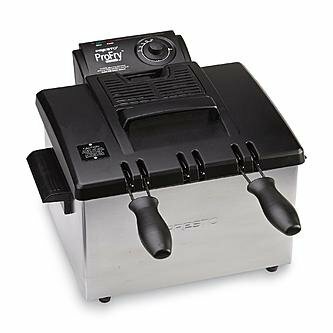 Whether it's a delicious snack like a mini taco or an elegant meal like eggplant parmesan, this fryer will get the job done. The convenient signal lets you know when the oil is ready for use. After you and your family enjoy that delicious meal, you'll be delighted to see how easy it is to clean this unit! If you have any questions about this product by National Presto, contact us by completing and submitting the form below. If you are looking for a specif part number, please include it with your message.